Stroke/ Heart Disease: Periodontal disease is a chronic infection in the oral cavity. It festers billions of bacteria that is introduced into your bloodstream each and everyday. Respiratory Infections: Inhaling bacteria from your mouth can lead to respiratory infections and possible pneumonia. Severe Osteopenia: Reduction in bone mass is associated with bone loss and tooth loss. It is more commonly associated with post menopausal women. Uncontrolled Diabetes: Chronic periodontal disease can disrupt diabetic control, and increase bacterial growth in the oral cavity. Diabetic smokers increase their chance of tooth loss by 20%. People with Type 2 Diabetes are also 3 times more likely to get periodontal disease. Tooth Loss: Having periodontal disease over time will result in bone loss around your teeth, causing them to become loose and eventually fall out! How Do We Treat Periodontal Disease? Come in to the office for a comprehensive exam, x-rays, and periodontal charting to come up with a treatment plan. If periodontal disease is present we will need to do a procedure called Scaling and Root Planning. Those appointments will be broken up into two separate appointments. Most patients are fine with just a topical anesthetic (numbing gel), but some patient do need a local anesthetic to be comfortable. Remember, we do not want to “hurt” ANYBODY!!! Following the scaling and root planning appointments we recommend you come in for cleanings every 3 months (Yes, four times a year!). In some cases we prescribe a low-dose antibiotic call Periostat or Tetracycline. 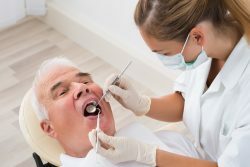 With proper home care (brushing twice a day and flossing once along with an antiseptic rinse) and coming to see us regularly for cleanings we can delay or stop the progression of periodontal disease. As long as you do your part and we continue to do ours we can prolong the longevity of your happy smile!